X-Men: First Class is the thrilling, eye-opening chapter you’ve been waiting for ... hWitness the beginning of the X-Men Universe. Before Charles Xavier and Erik Lensherr took the names Professor X and Magneto, they were two young men discovering their superhuman powers for the first time, working together in a desperate attempt to stop the Hellfire Club and a global nuclear war. $55.101 million on 3641 screens. With most superhero movies, you get the main character’s “origin story” in the first flick. 2000’s X-Men largely avoided that; it showed how a few new members joined that particular group, but it didn’t tell us much about how the X-Men came to be in the first place. Back in 2009, we got the origin for one of those characters - Wolverine - and 2011’s X-Men: First Class does what the 2000 movie didn’t: it shows us how the group came together. We open in 1944 at a Nazi concentration camp. When the soldiers attempt to separate young Erik Lehnsherr (Bill Milner) from his mother (Éva Magyar), he demonstrates the power to manipulate magnetic forces, which means he can do things like move metal gates. The soldiers knock him out before he completes that attempt, and he ends up in front of scientist Sebastian Shaw (Kevin Bacon). Shaw wants Erik to prove his skill again, but the boy apparently can’t do it voluntarily; even when threatened with his mother’s murder, Erik fails to move a coin Shaw challenges him to manipulate. When Shaw kills Erik’s mother, though, the boy’s rage proves enough to allow him to access his powers, and he destroys a lab. Around the same time, we meet young Charles Xavier (Laurence Belcher), a pre-teen who lives a privileged – though semi-neglected – existence in New York. When Charles hears a noise in the mansion’s kitchen, we seems to discover his mother (Beth Goddard), but it turns out this is actually a shape-shifting little girl named Raven (Morgan Lily). She lives a hand-to-mouth life and just wants some food; touched to find another mutant, the telepathic Charles semi-adopts Raven and they become “siblings”. With that we jump to 1962 and find an adult Erik (Michael Fassbender) on a mission to locate former Nazis and kill them. Eventually he hopes to track down Shaw, who he regards as his main target. Charles (James McAvoy) is a grad student in England who specializes in mutations; Raven (Jennifer Lawrence) remains with him, though she doesn’t attend school. In Las Vegas, CIA agent Moira MacTaggart (Rose Byrne) follows a military officer named Colonel Hendry (Glenn Morshower) who appears to be up to no good. When she traces him to a nightclub, she sees something remarkable: a mutant named Azazel (Jason Flemyng) transports the colonel to an alternate location. Of course, MacTaggart’s superiors don’t believe her fantastic tale, so she looks up Charles to add credibility to her story. He presents his theories to the suits – and then proves their reality when he and Raven demonstrate their abilities. 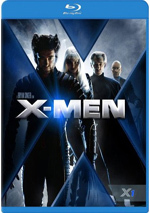 From there Charles and others recruit additional mutants – including Erik – to their cause. This becomes more urgent due to Shaw’s activities. He believes mutants must band together to wipe out humans and become the master race, and he plans to use the Cold War tensions to assist his cause. We see the X-Men come together under Xavier and battle Shaw and other foes. Most superhero movies work well within the “origin story” framework because they involve characters who obtain their powers along the way. Think about Batman, Spider-Man, the Fantastic Four, Daredevil, Green Lantern, Captain America, Hulk – all started as normal humans who later came upon their skills due to outside events. Even those who were born with their abilities – like Superman and Thor – still needed something significant to affect them to develop their abilities. All the X-Men mutants were born with their powers, though many didn’t access these skills until puberty or so. This makes origins a bit tougher to tell most of the time, as the tales just don’t have a lot of narrative behind them. 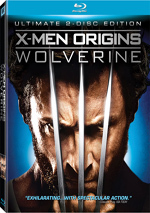 Even when the series attempted the origin of Wolverine, it didn’t really work in that vein; it really was a pretty standard X-Men flick with a little “origin story” tossed into the mix. Because it focuses on the creation of the team, Class definitely follows the “origin story” template in a more satisfying way. No, it doesn’t show the characters as they attain their powers, but it tells us how the X-Men came to be, and that’s good enough. We don’t need to learn much about the earlier development of the participants, though we do get semi-origin stories for Charles and Erik; those make sense given their importance in the flick. The main orientation remains on how the X-Men came together as a squad, though, and Class tells that story well. Don’t expect it to trace the developments from the 1960s comics, though. Class definitely goes its own way, as it doesn’t even bother to replicate the composition of the original team. Other than Charles, only two 1963 X-Men appear here, and one of them – Angel (Zoë Kravitz) – is a different race and gender than her predecessor. The Beast (Nicholas Hoult) is the sole member of both the 1963 comics and the 2011 movie teams, and even he undergoes changes here that wouldn’t occur until much later in the mags. Original team members Cyclops, Iceman and Jean Gray would all play parts in the earlier X-Movies, but they’re nowhere to be found here. Many of the film’s characters didn’t even exist in the Marvel Universe until many years after the series’ start, and they receive substantial changes to fit into this movie’s tale. For instance, Shaw had nothing to do with Nazis in the comics, and Raven never boasted such a close relationship with Xavier. So don’t expect Class to be faithful to the magazines. I’d be curious to know if this bothers the serious fanboys, as I suspect it may. For me, I’m fine with story/character points that vary from the source as long as they make sense and work within the film’s universe. For instance, I disliked the changes in Spider-Man’s origin from the 2002 movie because they didn’t help with the character or the tale. I also thought the decision to make Jack “The Joker” Napier the one who killed Bruce Wayne’s parents in the 1989 Batman was lame. First Class takes far more liberties than Spider-Man or Batman did, but they bug me less. Granted, I’m a much bigger fan of those franchises, so I’ll be more territorial with those characters, but I just think the story of <>Class works so well that its alterations fit well. The variations don’t come across as gratuitous; instead, they add depth to the movie and make it more effective. Even with these changes, Class still feels “right”. It’s fast-paced and fun most of the time, and I must admit it’s a delight to see so many of these characters in their early stages. The film takes itself seriously when necessary but also knows when to play with the material. Expect a few cool cameos and cute nods toward the franchise; the movie doesn’t quite wink at the audience, but it acts in a way that acknowledges we already know a lot about the series. With so many characters on display, development doesn’t excel, but that side of things works more than well enough. Character exposition certainly never becomes a liability, and the movie gives us what we need. Of course, some roles get more attention than others – especially Xavier, Erik and Raven – but we still have enough attention on all to satisfy. Across the board, the actors do nicely. I wasn’t wild about McAvoy in the action context back during 2008’s lousy Wanted, but he embodies Charles well. He gives the role the playful vibe necessary for the grad school scenes but also demonstrates the growth that makes us buy him as mentor to all the young mutants. Heck, McAvoy even looks a ton like the comic book Xavier; just shave his head and they’d be virtually identical! Surprisingly, the only minor weak link in the cast comes from its greatest veteran. Kevin Bacon never really fits into the X-Men universe, though I can’t explain why. He doesn’t look down on the material or camp it up; he just doesn’t feel quite right as Shaw. On the other hand, Bacon does nothing to hurt the film, and at least he gives it some star power, though he seems to have been absent from ad campaigns. I had no idea Bacon was in the flick until I saw him onscreen, and even then, I assumed he’d play a cameo; I figured Shaw circa 1944 would be the last we would see of him, so I was completely surprised to see him play such a major part. Despite that minor weakness, Class usually works quite well. It does pretty much everything we’d want from a superhero movie. It tells an interesting tale – and tells it well – with a mix of good characters and lively action pieces. All that and (almost) World War III, too! Class is the best of the five X-Men-related films to date. 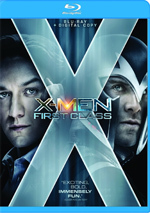 X-Men: First Class appears in an aspect ratio of approximately 2.35:1 on this Blu-Ray Disc. Though generally attractive, the image lacked the sparkle I’d expect of a brand-new big-budget affair. Sharpness was the weak link, as definition seemed inconsistent. At best, the movie showed very solid clarity, and at worst, it was still decent. However, “decent” isn’t what I want from Blu-ray. Though the majority of the movie exhibited good to great delineation, the occasional mild softness was a distracting anomaly. At least the image lacked any jagged edges or shimmering, and I noticed no edge haloes. Digital noise reduction didn’t seem to be a factor, as we got ample natural grain. No print flaws marred the presentation. Like virtually all “period films”, Class went with a palette that favored a semi-golden feel. The colors tended toward the low-key side of natural a lot of the time, with a mild amber tint. This meant the hues didn’t dazzle, but they satisfied. Blacks were dark and tight, and shadows were mostly fine; a couple of scenes looked a bit dim, but those weren’t a real issue. The occasional softness remained the most obvious minor distraction and the reason I registered this as a “B” transfer. Fewer qualms greeted the DTS-HD MA 5.1 soundtrack of First Class, as it displayed the kind of active environment expected from superhero movies. Indeed, the array of powers on display meant that the flick showed more variety than usual. We heard characters that flew around the room, those that blew up things, and those that went with a more psychological approach. All of these factors meant a nearly-constant soundscape with a mix of exciting elements in all five channels. The material fit together well and wasn’t limited solely to super powers. The military scenes meant gunfire and explosions, so those added to the package. Throw in good stereo score and this was an immersive soundtrack with a lot to involve the viewer. Audio quality worked fine. Speech was distinctive and concise, while music showed nice range and punch. Effects were the most prominent aspect of the track and seemed powerful and clear. Bass response was tight and deep throughout the movie. All of this added up to a fine auditory experience. When we head to the set’s extras, we launch with X Marks the Spot. This offers a collection of featurettes you can either view as the movie plays or on their own. I selected the latter option and found eight sequences with a total running time of 19 minutes, 55 seconds. These include “Erik in Auschwitz” (1:57), “Charles Meets Raven” (1:57), “Mr. Howlett Declines” (1:55), “Mindscape” (1:49), “Emulsion Journey” (4:14), “Rebecca’s Return” (1:44), “Cuban Beach Pre-Viz Sequence” (3:08) and “Retro Cool” (3:11). Across these, we hear from director/co-writer Matthew Vaughn, producer designer Chris Seagers, visual consultant Russell De Rozario, producer/co-story Bryan Singer, producers Simon Kinberg and Lauren Shuler Donner, visual effects designer John Dykstra, film editor Eddie Hamilton, 2nd assistant cameraman Wil Morris, production sound mixer Simon Hayes, HD dailies colorist Darren Rae, 1st assistant editor Adam Gough, Prologue title design and creative direction Kyle Cooper and Simon Clownes, and actor Jennifer Lawrence. The clips look at set design, various effects and visual choices, shooting cameos, a split-screen animatic/final film comparison, and the end credits. Obviously these pieces don’t add upto a tight glimpse of the production; we’ll get that later on the Blu-ray. We do find a bunch of useful notes here, along with good shots from the set. These make “Spot” a fun and informative addition to the set. Movie music fans will be happy to find the film’s isolated score. This presents Henry Jackman’s work in Dolby Digital 5.1. Isolated scores used to be a staple of DVDs but they went the way of the dodo; it’s nice to see them make a comeback. Cerebro: Mutant Tracker offers a weird kind of interactive component. It shows an array of mutants and if you hit “enter” when you see one, you’ll get to view some footage and text about the character. If you “collect” all of them – which is easy - you can access additional mutant profiles via BD-Live. It’s an odd feature and a clumsy one; a more straightforward package of character bios would be more enjoyable. The package improves with Children of the Atom, a seven-part documentary that runs a total of one hour, nine minutes and 49 seconds. We hear from Vaughn, Donner, Kinberg, Singer, Lawrence, De Rozario, Seagers, Dykstra, executive producer Tarquin Pack, co-screenwriters Ashley Miller, Zack Stentz and Jane Goldman, Beast and special makeup designers Tom Woodruff, Jr. and Alec Gillis, Beast makeup effects Dave and Lou Elsey, head of makeup and hair department Frances Hannon, costume designer Sammy Sheldon, costume props supervisor Ivo Coveney, special effects supervisor Chris Corbould, Rhythm and Hues visual effects supervisor Greg Steele, Rhythm and Hues look development supervisor Dante Quintana, Rhythm and Hues digital supervisor Johnny Gibson, Rhythm and Hues VFX art director Chris Grun, Digital Domain visual effects supervisor Jay Barton, Digital Domain character modeling lead Dan Platt, Digital Domain digital double lead Chris Norpchen, Digital Domain character animator Kiel Figgins, Digital Domain animation supervisor Bernd Angerer, Digital Domain effects animation supervisor Brian Gazdik, composer Henry Jackman, and actors James McAvoy, Michael Fassbender, Kevin Bacon, January Jones, Jason Flemyng, Zoe Kravitz, Rose Byrne, Lucas Till, Caleb Landry Jones, Nicholas Hoult, Alex Gonzalez, and Edi Gathegi. “Atom” examines the origins and development of the film, bringing Vaughn on board, story and character topics, cast and performances, makeup, costumes, style, set design and influences, visual effects, music and where the franchise goes from here. 13 Deleted Scenes fill a total of 14 minutes, seven seconds. We find “Erik in Argentinean Airport” (0:54), “Shaw with Cuban Generals” (0:29), “Charles and Moira’s Tryst Part 1” (1:24), “Charles and Erik Recruit Angel (Extended)” (1:15), “The Russian Truck (Extended)” (1:14), “Erik Vs. Russian Guards (Extended)” (0:21), “Shaw’s Plan (Extended)” (0:49), “Havok Training Part 1 (Extended)” (2:08), “Banshee Training Part 1 (Extended)” (1:36), “Havok Training Part 2 (Extended)” (1:09), “Banshee Training Part 2 (Extended)” (1:14), “Hank and Raven in the Lab (Extended)” (0:52) and “Charles and Moira’s Tryst Part 2” (0:42). I’m sure you noticed the “extended” appellation for nine of the 13 scenes. That means we find limits on the amount of new footage on display, as much of the material repeats from the final flick. The additions deliver some interesting content, such as the gag Charles plays on Erik during “Recruit” – but most are pretty inconsequential. As for the totally new scenes, the two Charles/Moira sequences seem to be the most interesting. The film teases us with a potential relationship between the pair, and those two segments throw a little more fuel on the fire; they're enjoyable to see. “Airport” and “Generals” are less intriguing. I’m not sure the “Tryst” pieces should’ve made the final flick, but they’re fun. A second disc provides a Digital Copy of the film. As always, this allows you to easily transfer the movie onto a computer or portable viewing device. Yay! While I’ve enjoyed the prior X-Men movies, none of them really excited me. First Class changes that, as it provides a playful, lively adventure that leaves me anxious to see more from the franchise. The Blu-ray provided good but unexceptional visuals along with excellent audio and a pretty informative set of supplements. First Class isn’t a great Blu-ray, but it’s a positive one, and the movie’s a blast.